The Hotel Brokers International members have elected their 2017-18 Board of Directors during their 58th Annual Meeting held in Las Vegas. 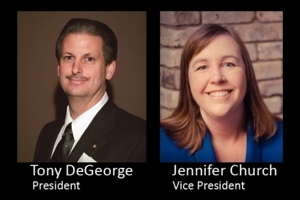 Tony DeGeorge, president of Clearwater, Florida-based Greene, Canfield, DeGeorge, LLC, and Jennifer Church, president of Milmark Hotel/Motel Investments, LLC, were chosen by their peers to serve as the organizations President and Vice President, respectively. President, founding partner and principal broker of Greene, Canfield, DeGeorge, LLC in Clearwater, Florida, Tony has been actively involved in hotel brokerage since 1981 and has been directly involved in the listing, marketing and sale of hundreds of hotels including dispositions for corporations and REITs as well as individuals. His impressive transaction resume includes the sale of an array of hotel property types including everything from select-service airport hotels to beach-front resorts. As a former hotel owner-operator, Tony has first-hand knowledge of hotel operations, cash flow management and marketing. He earned his Certified Hotel Broker (CHB) designation in 2000 and is a three-time past president of Hotel Brokers International; serving on the organization’s Board of Directors for more than 20 years. Jennifer Church is president of Milmark Hotel/Motel Investments, LLC – a full-service hospitality real estate investment and consulting firm, licensed in Wisconsin. Jennifer has nearly 13 years of professional experience in hospitality real estate sales, and she has continuously been recognized for outstanding hotel sales performance – named Rookie of the Year in her first year and most recently Top Sales Producer in her region. Prior to serving as President of Milmark, she served as the firm’s Director of Sales when she earned designation as a Certified Hotel Broker and was awarded three of the four top honors in her CHB Class. Jennifer previously worked as Director of Operations & Services at the Wisconsin Hotel & Lodging Association (WH&LA) – one of the largest lodging associations in the country. Jennifer received her undergraduate degree in Hospitality and Tourism Management at the University of Wisconsin – Stout and earned her Master’s in Public Administration from the University of North Michigan. Steve Blue is the sole owner of Scoggin Blue LLC – a real estate brokerage company with offices in New Mexico and Texas specializing exclusively in selling hospitality real estate since 1959. Steve has been in hotel/motel asset value assessments and direct marketing of hotel/motel properties since 1979. Prior to joining the firm, Steve received a Bachelor of Accountancy Degree from New Mexico State University in 1976, and subsequently managed several Texas-based hotels. Since 1979, he has personally generated direct sales in excess of $200 million. Steve’s strengths include asset value assessment, sales, management and operations. Michelle Kennedy is a partner and principal/designated broker of Crystal Investment Property, LLC – a boutique specialty brokerage solely focused on serving the needs of hotel owners and investors in Oregon, Washington and Idaho. Michelle has a 20-year background in administration, real estate and legal education, contracts, and operations management for regional commercial real estate firms. Michelle’s focus with Crystal Investment Property, is primarily on operations oversight, transaction management, marketing coordination and general back-office systems. Steve Quintana is president of HawksView Hospitality, a full service brokerage firm based in the Denver suburb of Lone Tree. Steve specializes in hotel asset investment, valuation, marketing and transaction. Prior to founding HawksView Hospitality, Steve worked with a national commercial brokerage firm. He holds an undergraduate degree in business management and is an entrepreneur who owns businesses and real estate. Richard Ehmer is president and principal broker of The Ehmer Group – a full-service hospitality real estate investment and consulting firm located in San Francisco, California. Richard has more than 30 years of experience in the marketing and negotiating of commercial real estate transactions including the closing of more than $1,500,000,000 in hospitality transactions. Richard currently owns and operates several hospitality assets in San Francisco. Richard has served on the HBI Board of Directors since 2014. Errol D’Souza is president and principal broker of Laurel Real Estate Company, a full service real estate brokerage and advisory firm located in the Columbus, Ohio area. Errol began his real estate career in 1997 and has consistently been a top producer in hospitality real estate sales and was recognized in 2015 as Broker of the Year. Errol has a diverse business background having worked in, invested in, or owned, businesses in accounting, hotels, real estate, restaurants, retail, and technology companies. Errol earned his MBA in Accounting and Finance from Ohio University and in 2002 earned professional designation as a Certified Hotel Broker (CHB). Kathryn Seo, vice president of Lodging Brokers Network, Inc., has more than ten years of experience in the hotel and real estate industries. Her career in hospitality real estate includes working for an international hotel brokerage firm and holding acquisition and development roles at two of the major boutique hotel companies, most recently Kimpton Hotels. For the five years prior to joining LBN, Kathryn led due diligence efforts on acquiring boutique hotels, and has valued hundreds of hotels and inns across the country. In each of the most recent three years, Kathryn has earned and been awarded HBI’s top individual sales achievement award – Salesperson of the Year. Kathryn holds a degree in Real Estate Finance from Cornell University. Darin C. Brock serves as vice president of Dallas-based Brock Hotel Group and joined the firm in 1998 representing hotel sellers throughout the South Central United States. During his tenure with the firm, Brock has achieved and been recognized nine times as regional Top Salesperson. Brock is a graduate of the University of Denver and has earned the professional designation of Certified Hotel Broker (CHB). Diana Alt is an associate broker with Las Cruces, New Mexico-based Scoggin Blue LLC, and has managed the brokerage firm’s Dallas office since 2002. She has been involved in the hospitality industry since 1989. Prior to Scoggin Blue, Diana was with Hotel Management magazine. With her years of professional experience in the hospitality industry, Diana easily makes contact with top executives and decision-makers of hotel companies, hotel owners, franchise, financial and management companies as well as REITs and others interested in buying and selling hotels. Diana has her B.B.A. in Marketing from the University of Texas in Arlington. H. Brandt Niehaus, CHB, is president and principal broker of Huff, Niehaus & Associates, Inc., a full-service hotel real estate brokerage located in Louisville, Kentucky. Brandt began his career in commercial real estate in 1983 and has focused exclusively on hotel real estate investment since 1988. He has successfully transacted the sales of hundreds of hotel properties from limited-service independents through full-service luxury hotels representing sellers in conventional sales as well as lender-owned transactions for banks and institutions. A consistent top sales producer, Brandt was named Broker of the Year in recognition of his record-setting sales performance in 2014. Brandt, a three-time Past President of HBI, holds the professional designations of Certified Hotel Broker (CHB), Certified Hotel Administrator (CHA) and Certified Commercial Investment Member (CCIM). Brandt earned his Bachelors and MBA in Marketing from the University of Kentucky. Founded in 1959, Hotel Brokers International members lead the industry in hotel real estate sales. HBI hotel brokerage specialists have successfully negotiated more than 10,500 hotel real estate transactions and consistently account for the largest share of all select-service and economy hotel sales in the United States. The organization’s database currently comprises more than 100 property listings and the HBI website attracts site visitors from around the world. Founder and host of the popular Hotel Investor’s Marketplace Webcast, HBI also developed the Certified Hotel Broker professional designation program. In addition to hospitality real estate advisory services, HBI offers affiliate membership to professionals in allied fields, including franchising, lending, appraisals and investment services. For more information about HBI’s hotel listings or to become a broker or affiliate member, visit www.hbihotels.com.